The Sidney Sun-Telegraph has proudly been serving as the beautiful Nebraska Panhandle’s first newspaper since 1873. We publish twice a week, Wednesday and Friday. The editions are distributed by mail. 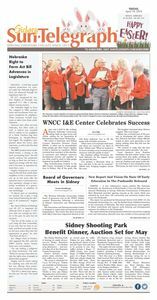 The Sidney Sun-Telegraph is printed in-house at 817 12th Ave., Sidney, NE 69162-1625.